The painting - Market Woman with Vegetable Stall, demonstrates a wide range of agricultural products, made possible by the improvements in production methods. Offering her fruits and vegetables, the woman is almost an appendage to her produce. Despite all exaggeration, the picture quite adequately shows the new economic prosperity of the time. At the same time, however, it still contains a background scene in genre style of embracing lovers in a stable, thus relating the painting to late medieval peasant satires. Peasants were regarded as lustful, sensuous and carnal by the middle classes. SPECIAL NOTE : The painter will make the reproduction as close to the original oil painting as possible. 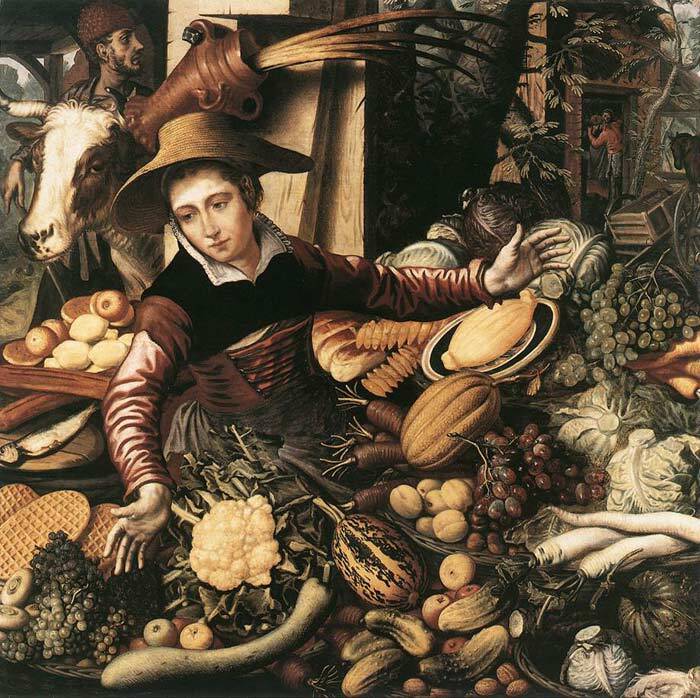 If you want your painting to alter from this likeness, please email us and " Market Woman with Vegetable Stall, 1567 " will be reproduced according to your special requirements.